Built in 1913, this school was constructed on the site of the original 1800s school. Located in a prominent downtown location, the striking architectural design still allows the abandoned school a presence that made the community proud when it was built. Additions to the building over time resulted in the huge complex that fills an entire city block. It was used by the school district until the 1980s, but is now vacant and deteriorating, only infrequently used by the local Jaycees as a haunted Halloween house. A nonprofit organization, the current owners of the property, failed to find a use for the school and they soon will deed the building to the City of Denison. The city plans to tear it down as soon as they have raised $500,000, an amount they estimate will be needed to do the job. The Texas Historical Commission, the National Trust, and Preservation Texas visited the city to urge the mayor and city manager to reconsider their plans; citizens have called and written city officials asking them to save the building for re-use. 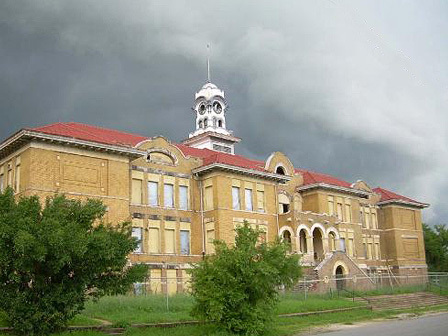 By mid-October 2007, the demolition of the 1913 Denison High School was completed except for the clock tower. The clock tower was purchased from the demolition contractor by City and it remains on the site of the former high school building. The demolition of the historic school came after months of organized protests of the Denison City Council’s decision by the group known as Save Denison History. Preservation Texas along with the Southwest Office of the National Trust for Historic Preservation, the Texas Historical Commission, and individuals across the country wrote letters urging the city council to consider the benefits of preserving the Old Denison High School. At a September 4, 2007 City Council meeting, the Council voted to continue with the demolition of the school. This surprised the community since on Monday, August 20, the Denison City County voted to give the Save Denison History group until September 4, 2007 to negotiate an ownership/lease agreement with the city and to provide $550,000 in guaranteed funding. The group has until the end of the year to set goals for the three phases of the renovation project. The restoration of the historic school was estimated to cost $5 million.